Imagine, if you will, two sisters living and working in a village not so very far from London. They both liked good food, strong drink and nights out, but their chocolate shop was never going to fund the lifestyle they wanted. In fact, they could barely make ends meet, and so they agreed that it was time for a change. 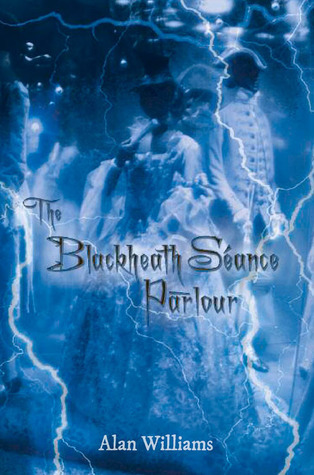 Maggie, the leader of the pair, suggested that what Blackheath needed was a curtain shop, but Judy told her that as the chocolate shop had been Maggie’s idea it was her turn to make the decision, and she was going to open a séance parlour. The sisters did not agree, but in the end Judy got her way; she recruited Mrs Nettie Walters, an ageing medium, she painted everything black, and the Blackheath Séance Parlour opened for business. Their timing was not good – they opened for business on the day of the funeral of the most recent victim of a murderer who had been preying on women on the nearby heath – but after raising their eyebrows in disapproval curiosity got the better of the local population. They were impressed, and the news spread quickly and soon people were coming from far and wide, to have their tea leaves read, to discover what the crystal ball saw in their future, and to take part in séances. The Blackheath Séance Parlour became ridiculously successful. But success did not bring happiness. It brought new pressures, and the three women had different concerns, different hopes for the future, so soon jealousies, resentments and recriminations came to the surface. Nettie came face to face with the past she hoped was gone and forgotten, Judy found a publisher for her gothic novel and found that it brought her more notoriety, and after a slow start Maggie found that the séance business rather suited her, only to be horribly tricked. Take all of that, plus a novel within a novel – Judy’s wonderfully gruesome ‘penny dreadful’ – and you have a heck of a lot going on. But it works! The characters lived and breathed, their world was quite perfectly realised, the atmosphere was so very dark and sinister, and there was always something that made me want to keep turning the pages. The story was played completely straight – there was no explaining away of the supernatural elements – it was lightened with well judged dashes of humour and wit, and it was told with such verve. There were some magnificent set pieces, there was high drama, but ultimately this is a very human story that works because the relationships, characters and stories of the three women were so very well drawn, and so horribly believable. And because the story plays out exactly as it should, without ever becoming predictable. I was a little disappointed there were moments when the story drifted a little, and that there were moments when things went a little over the top. Though I should say that I think that’s due to my sensitivities being a little more delicate than those of the author, and not because he has done anything wrong. Those things made me pause, but I was never going to let go of this story. The mixture of the gothic and the historical, of mystery and horror, was unusual but it was very, very effective. « A Musical Interlude: I’ve been waiting for the right moment, and I think the moment is now ….. This does sound like a perfect Halloween book! I’ve never been to a seance, though I’ve played around with a Ouija board, but I love to read about them, real or faked. I’m not brave enough for Ouija boards or séances but I liked the way they were handled here. Definitely the right book on the right day! I think I might read this tonight after Hallowe’en is safely over, but that probably has more to do with my squeamishness over all things supernatural than the book itself. I’m fairly squeamish, but there were only a few bits I had to skim, and those bits didn’t put me off the book at all. Chocolate and seances? Count me in. Love your post; thanks for yet another great review! There’s not too much about chocolate – though I think the unsold stock was eaten – but the séances are very well done.